The defence in the Oscar Pistorius murder trial on Tuesday pursued its argument that police photographs prove investigators mishandled evidence at the scene where he shot his girlfriend Reeva Steenkamp. Barry Roux, for Pistorius, pointed painstakingly to changes in the position of objects in the paralympic athlete's blood-spattered home as he cross-examined police photographer Barend van Staden. Why, he demanded to know, was their such an apparent "disturbance" in a pile of objects on the bedroom carpet and why had some of them clearly been moved, he asked. Van Staden, the third policeman to take the stand, denied tampering and maintained that it was legitimate to pick up and move objects as part of the investigation of a crime scene. "It is just part of the investigation, My Lady." But Roux proceeded to ask where a CD that suddenly appeared in a sequence of photographs had previously been, prompting Van Staden to respond that it had been under the bed. "Who took it out underneath the bed and put it there?" the lawyer continued. He also criticised Van Staden for failing at first to take a photograph of the toilet door through which Pistorius fired four shots, fatally injuring Steenkamp last February. Van Staden replied that he believed it was not urgent to photograph the door -- which is now on display in the court as evidence -- because it was immovable and it was also not possible for anybody to erase the marks the bullets and a cricket bat had left on the wood. "I rely on my discretion," he answered. Roux also pointed out to Van Staden that he had patently moved the cricket bat which Pistorius says he used to break down the door after the shooting, and photographed it from different angles. "It seems there was movement of the bat," Roux said. Van Staden replied: "It seems so." Roux repeatedly asked Van Staden whether he was alone in a room while taking pictures and where his colleagues were at the time. Showing photographs taken in the bathroom where Steenkamp was shot, he asked: "When you took the photos are you sure you were alone up there?" "I'm certain of it," Van Staden replied. Roux then put it to Van Staden that one of the officers from the ballistics section of the forensics laboratory was taking photos of the scene at the same time as Van Staden. "There was a great overlap between you and Colonel Motha. You were together when you said you were alone." Van Staden replied he would have to look at the meta-data of the photos to see when exactly they were taken to be able to verify this. Roux later turned to a photograph of the outside of the house, with two figures visible through the upstairs bathroom window. He asked the witness when his colleagues went into the bathroom, attempting again to show that the scene was not properly controlled. Van Staden was forced to respond that he could not know this because he was outside at the time. He spent some two hours on the witness stand, in which time Roux implied not only that his testimony on whether he was alone at a particular time could not be trusted but also that he had withheld photographs from court "that give a different picture" of events. It was some of the most detailed evidence to be heard by the High Court in Pretoria since Pistorius went on trial here on March 3 for premeditated murder. 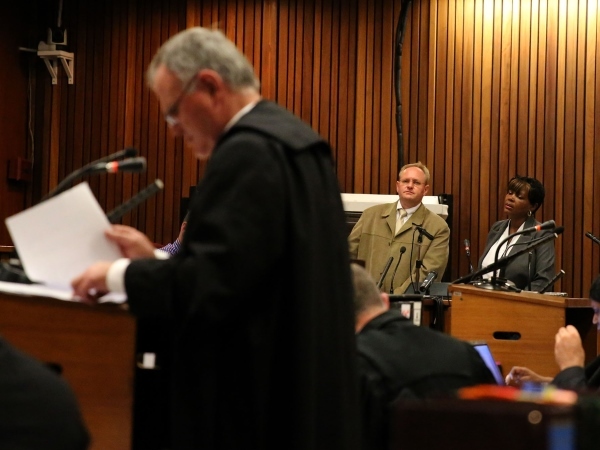 The State contends that he shot Steenkamp after the couple had a row, but in his version he believes that he was firing at an intruder hiding in his locked toilet cubicle. The police have so far been forced to admit in their testimony that an investigator picked up Pistorius's handgun without gloves, and that one of the disabled athlete's expensive watches disappeared from the scene. Roux's style of cross-examination again drew protest from State prosecutor Gerrie Nel on Tuesday, who said the defence lawyer was humiliating Van Staden by asking if he could tell the difference between the two sides of a cricket bat. Judge Thokozile Masipa rebuked Roux, saying: "To start with, you cannot argue with a witness... you cannot argue with a witness." Pistorius also faces charges of contravening the Firearms Control Act.